Award-winning cocktail bar Operation Dagger unveils a cutting-edge new cocktail and food menu that puts the spotlight on the use of modern culinary methods and traditional fermentation techniques. Ann Siang Hill basement cocktail Operation Dagger – which recently came off the back of its No.6 placing in the highly lauded Asia’s 50 Best Bars earlier this year, climbing up one spot from last year’s edition – isn’t resting on its laurels. While some other bars may choose to kick back and take a breather to celebrate the win, Operation Dagger’s Luke Whearty and Aki Nishikura has instead focused on brewing up new menu offerings. The result is a menu that not only clearly ascribes to the bar’s signature culinary approach but also one with sustainability in mind. Sustainability has always been something on co-founder Luke Whearty’s mind – even during Singapore Cocktail Week two years ago Operation Dagger introduced a special food and cocktail pairing menu called ‘Potential Wasteland’ that looks at how to repurposing and reusing potential ingredients that’s normally thrown away at restaurant and bars, such as watermelon rinds or oxidised wine. While this new menu doesn’t go quite as far as that, there are remnants of such culinary reinvention. Consider the Rikyu ($25 nett), a cocktail that’s a twist on the traditional Japanese tea ceremony using spirit derived from a malted rice base, but cleverly uses a “powder” made from drying out and grinding up cucumber skins to simulate matcha in the drink. Or how about the G.O.A.T ($25 nett), which for a garnish uses pineapple pulp that’s been converted into a tasty sweet savoury cracker to complement the cocktail that uses gin bizarrely infused with goat’s cheese? Where Operation Dagger largely differs from almost every other bar out there is its focus on natural ferments. Like a bunch of mad scientists Whearty and his team work on fermenting different fruits and vegetables – normally a 7 to 10 day process – into alcoholic beverages. You’ll see the likes of the more accessible Orange ($22 nett), which ferments together orange, carrot, melon and honey into a pleasantly sweet drink, to the more vegetal Cabbage ($22 nett), which puts together red cabbage, apple and rose vinegar for something that tastes like a health drink. Make sure you try the Tomato Beer ($22 nett); heirloom tomatoes, hops and malt are brewed into a savoury ferment. 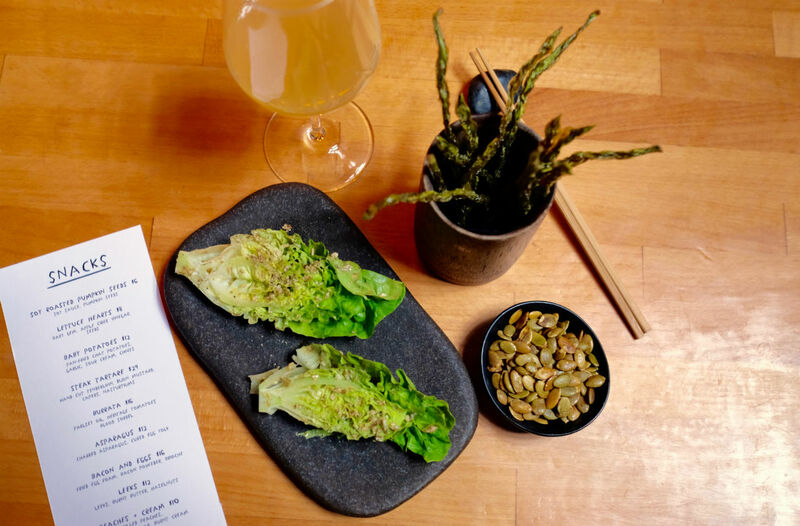 But don’t forget the food too – Operation Dagger has expanded its snack menu into a rather vegan- and vegetarian-friendly route. We’re particularly fond of the Soy Roasted Pumpkin Seeds ($6) or the very cheeky and crispy French Fries ($8), the latter French beans dehydrated and then deep fried. For something that’s more substantial there’s a rather classic Steak Tartare ($24++) available. We’ll have to say that the new menu is not for everyone – fermented drinks can be polarising, and most of the snack menu reads like rabbit food – but with this new menu Operation Dagger is again a cut above the rest where culinary and cocktail innovation is concerned. Next year’s placing in Asia’s 50 Best Bars should be safely in the bag.